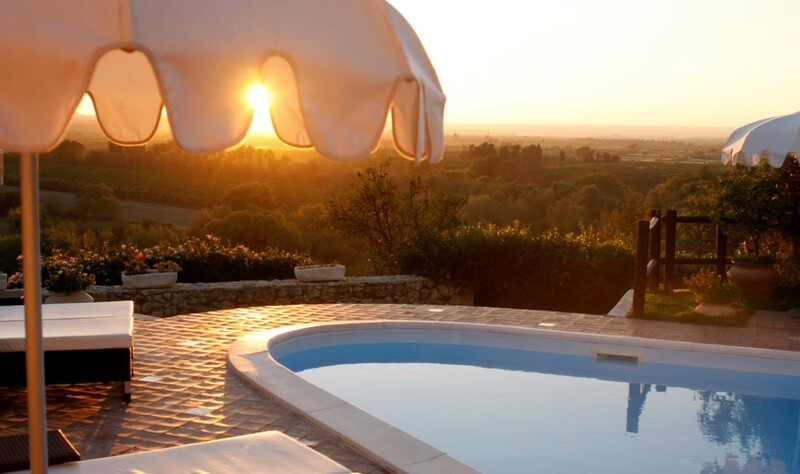 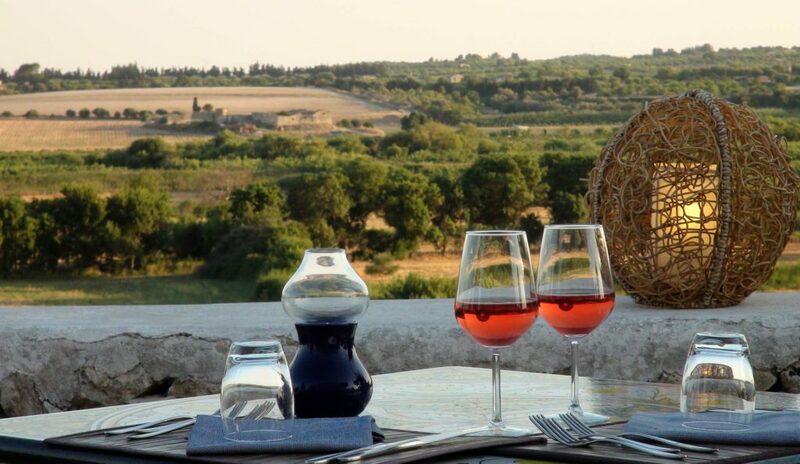 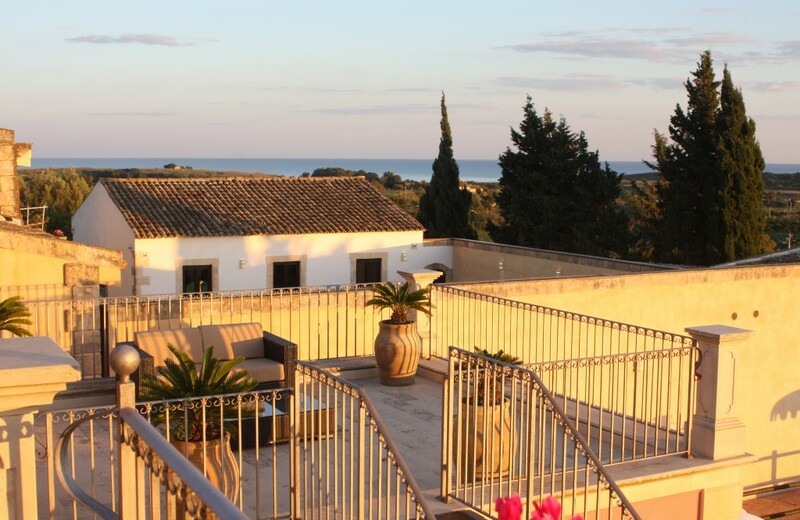 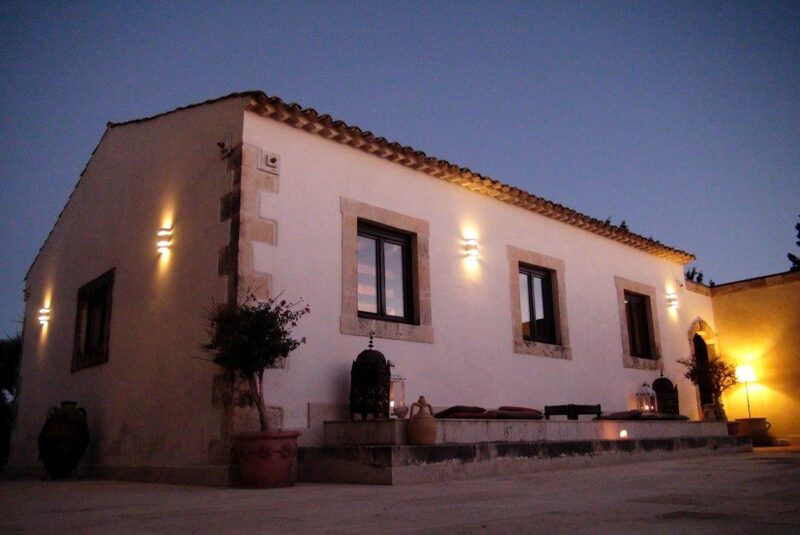 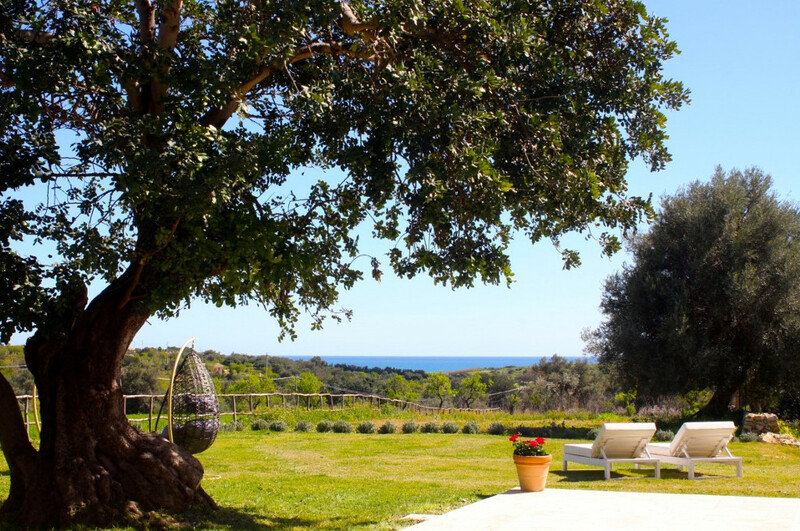 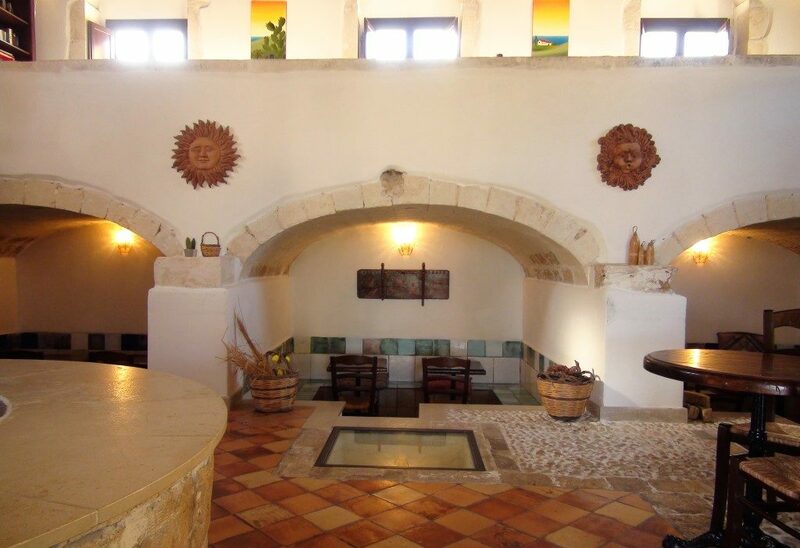 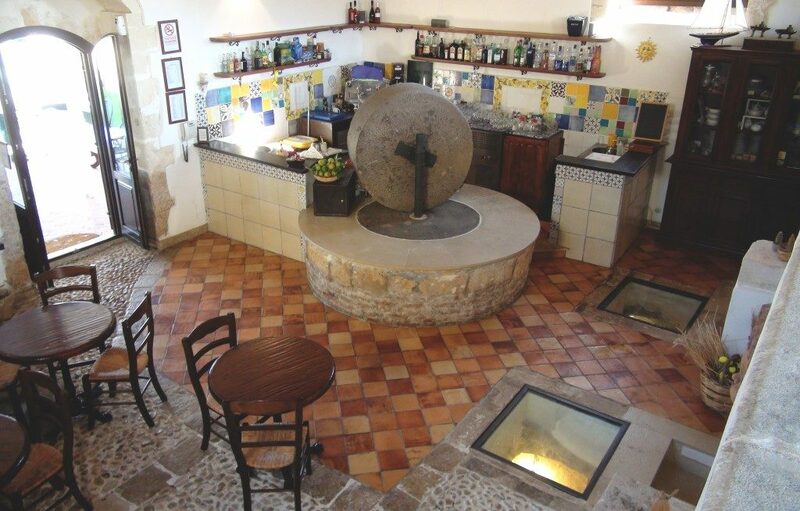 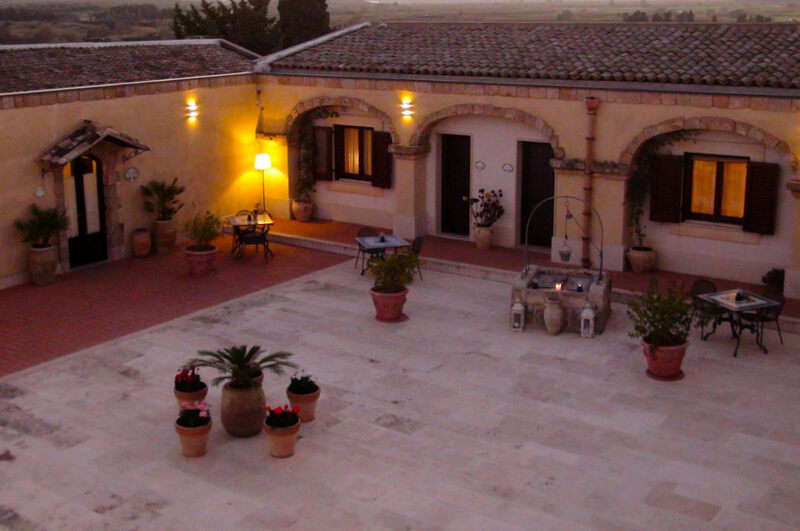 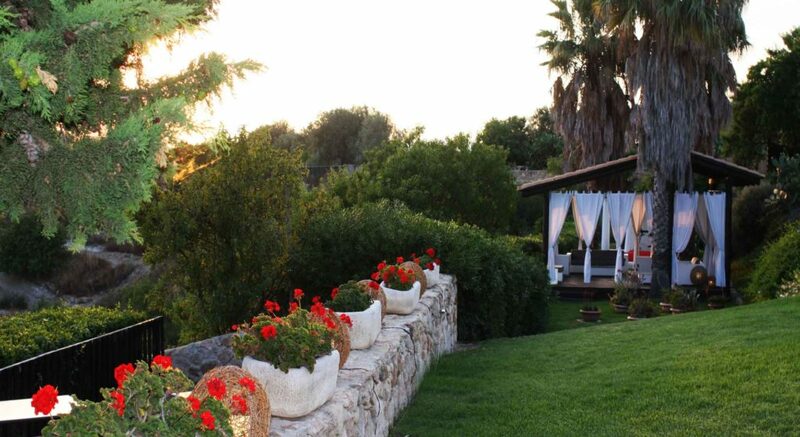 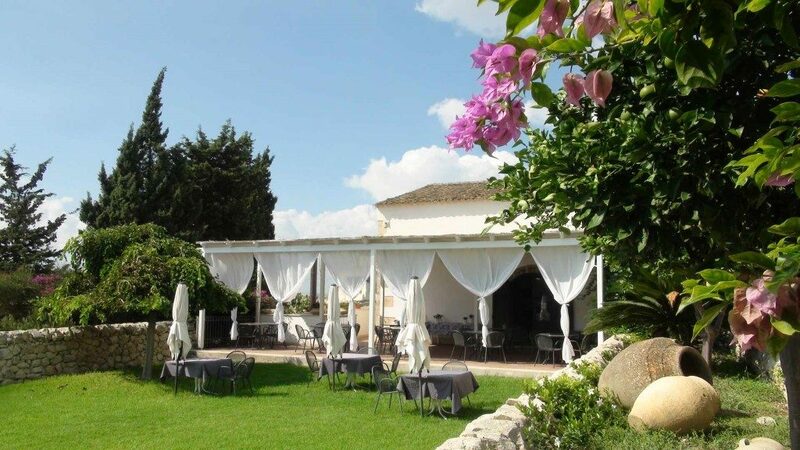 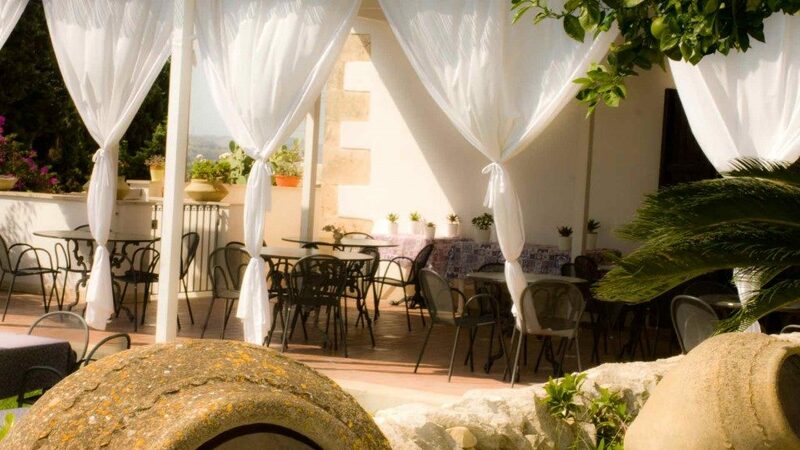 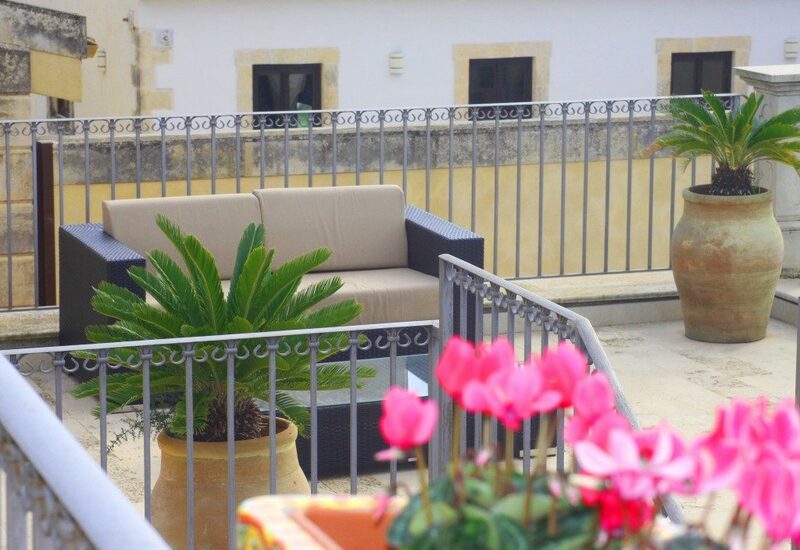 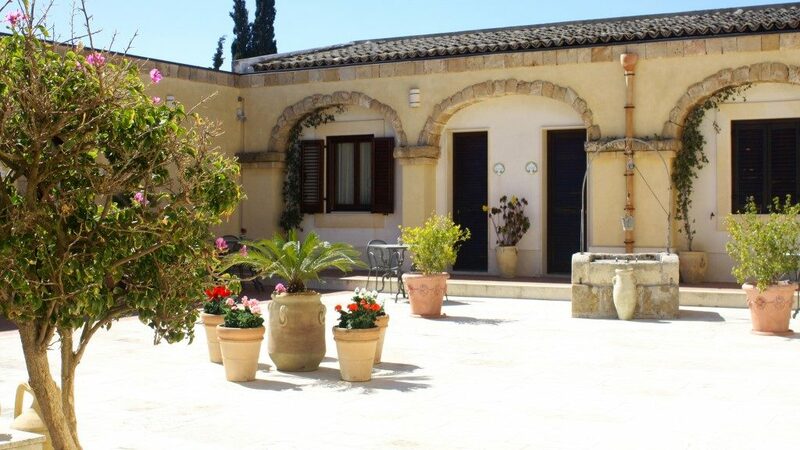 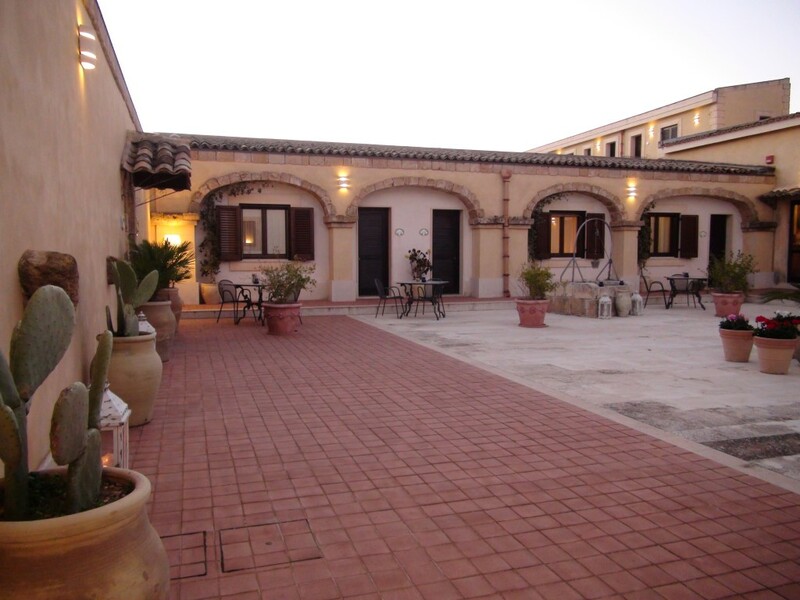 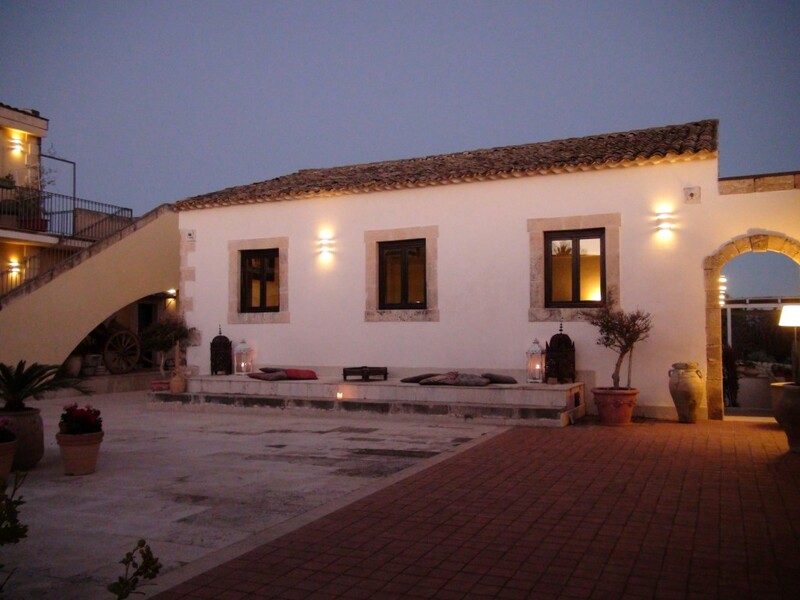 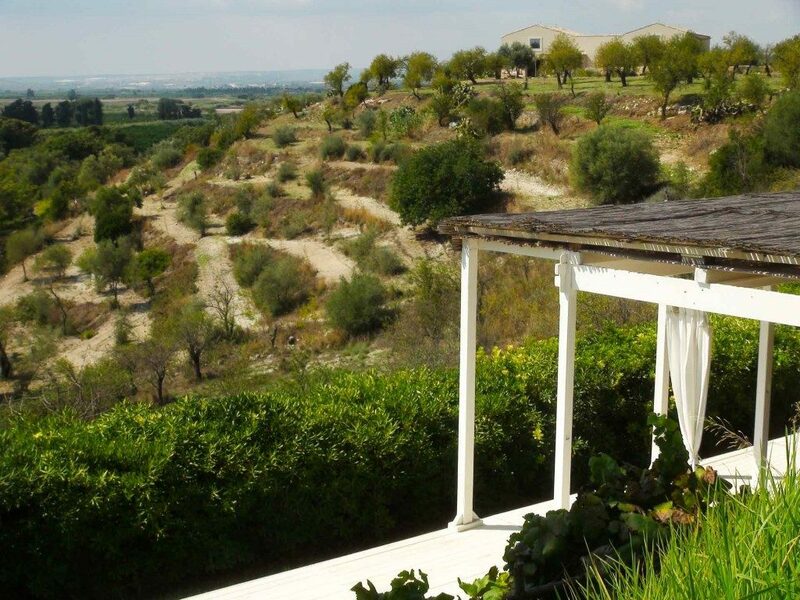 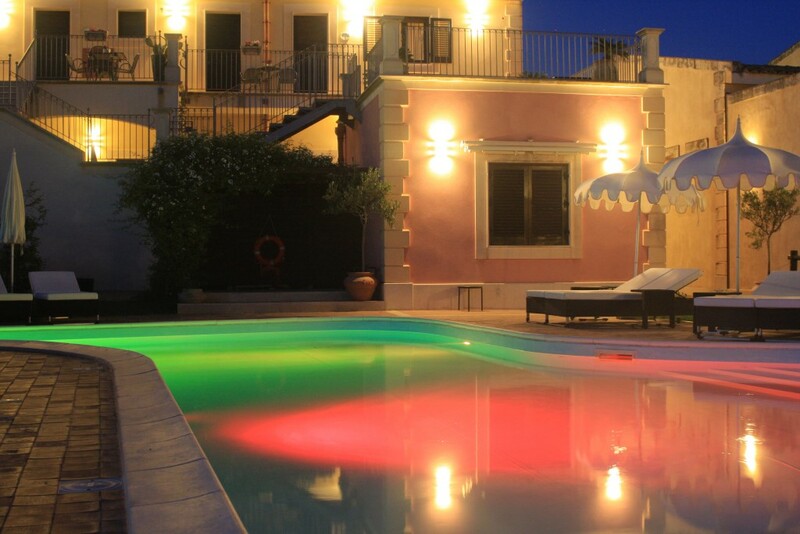 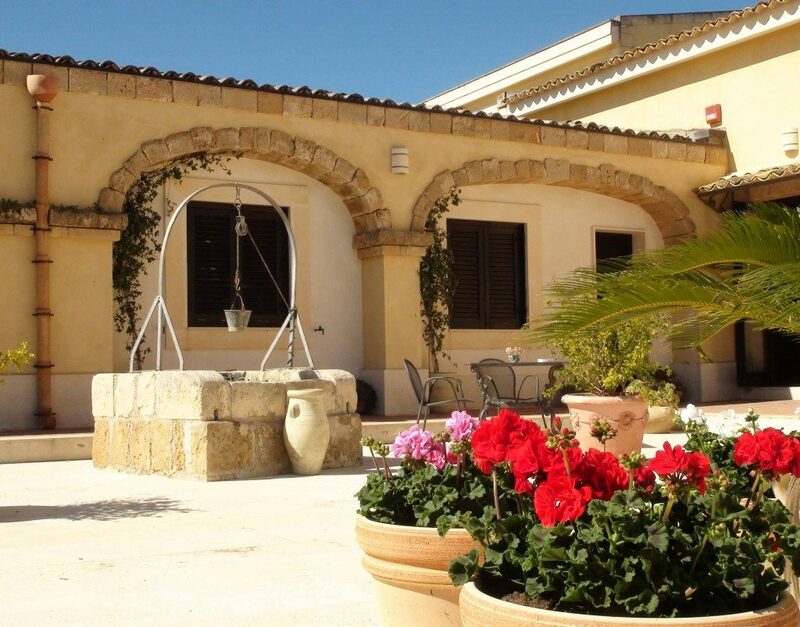 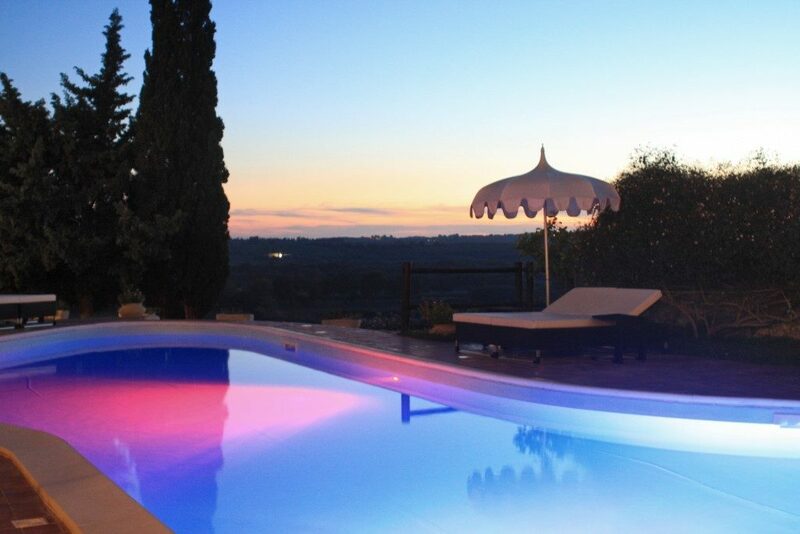 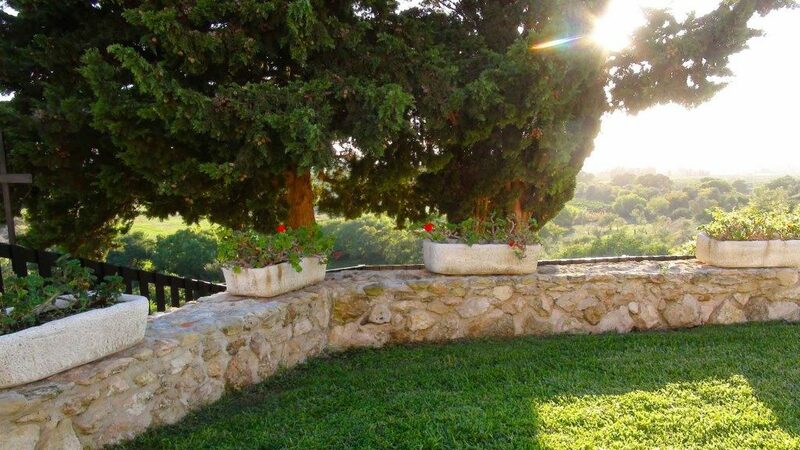 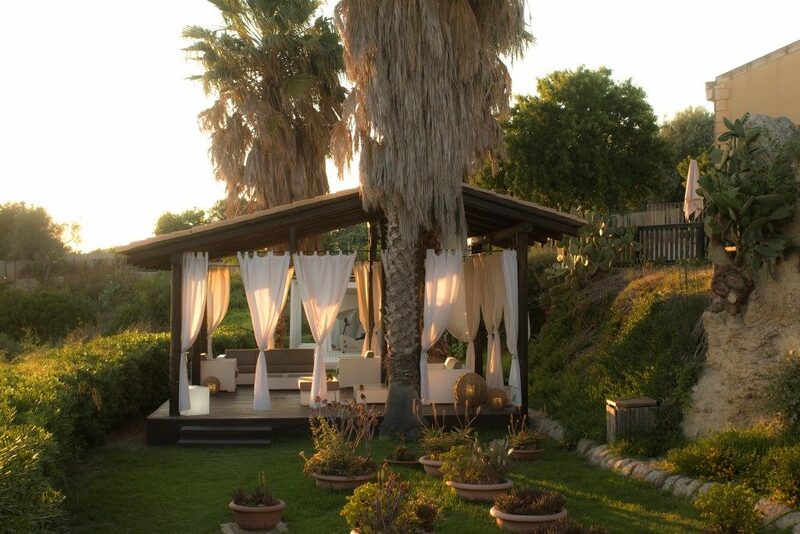 An antique masseria in the heart of the Val di Noto. 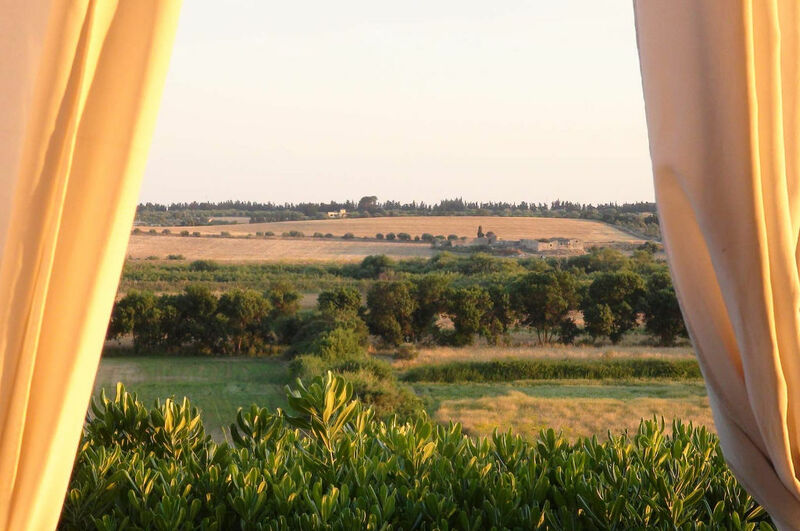 The hotel, set in a 20 hectares property, was born from the restoration of an old Sicilian masseria, full of details speaking of its cultural identity. 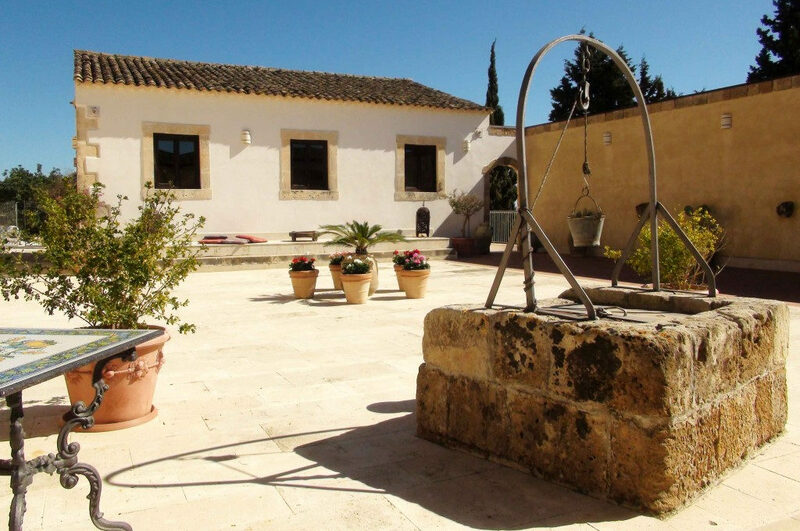 The evocatice courtyard made of white stone with a traditional old well is the heart of the place, all your holiday memories will start from here. 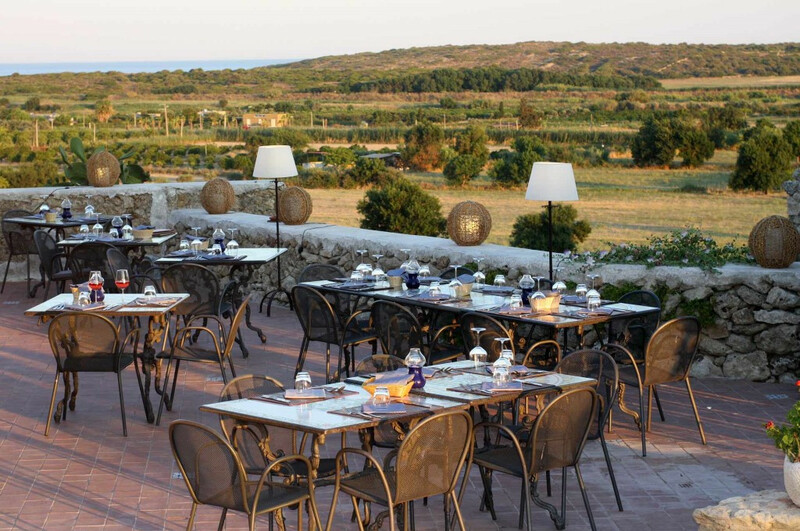 A tasting experience of Mediterranean flavours. 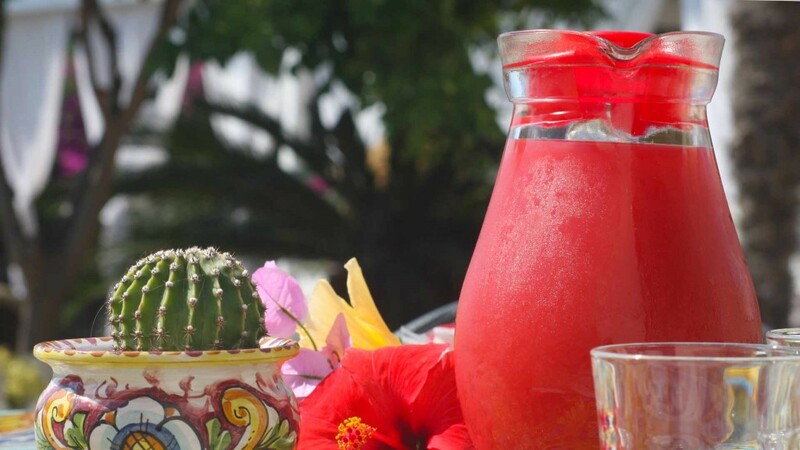 For a tasty and fresh break. 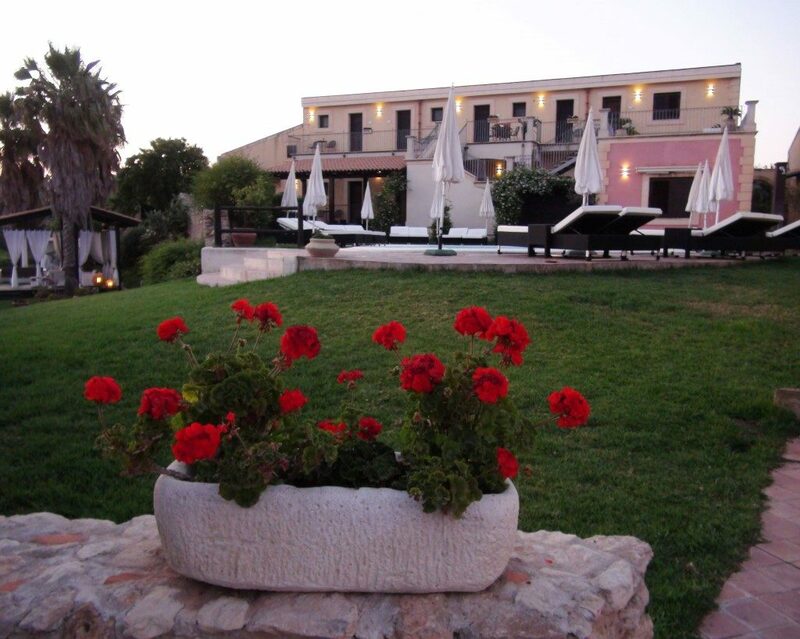 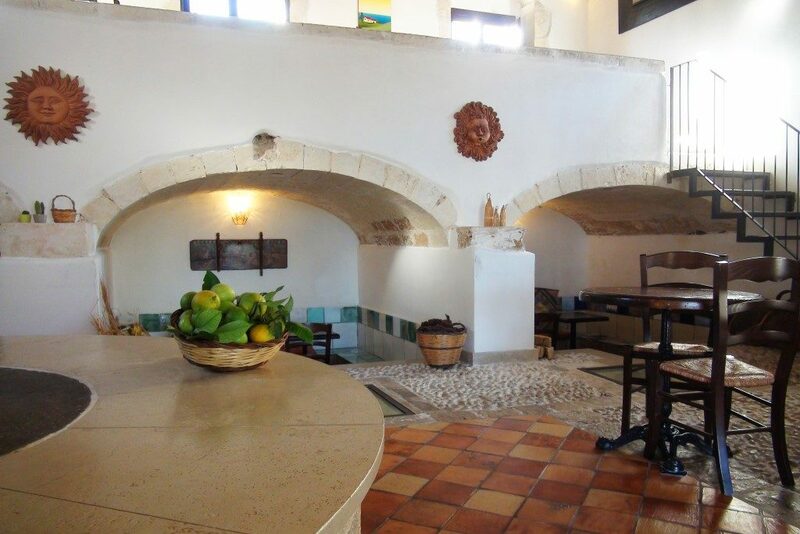 Lit by the warm light of Sicily, the courtyard is the focal point of the hotel. 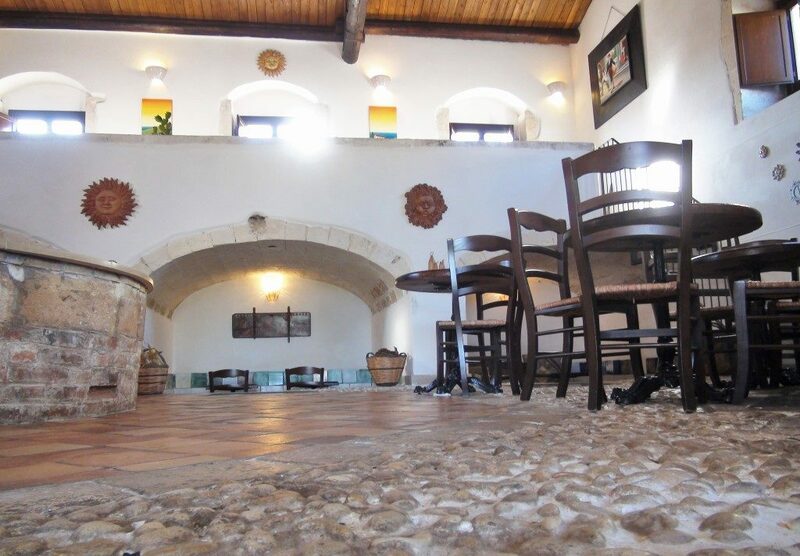 Details like the old well, the terracotta tables, the long seat full of cushions and the arabic lights make the place so charming. 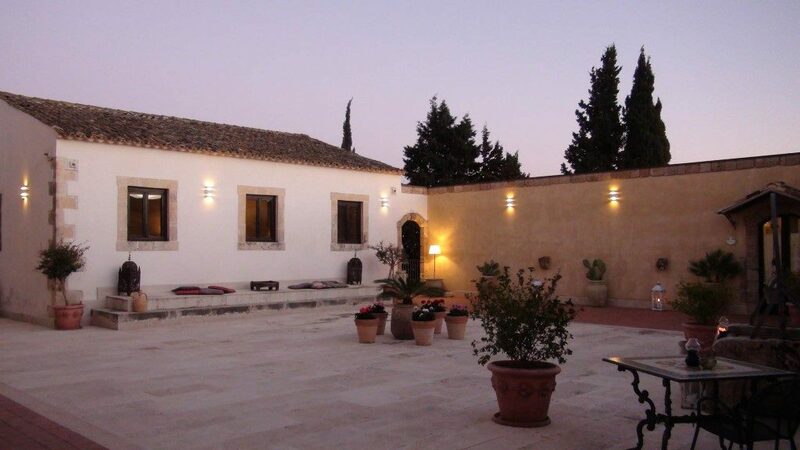 During the hot summer evenings, the courtyard is the perfect setting for themed evenings, food and wine events and parties. 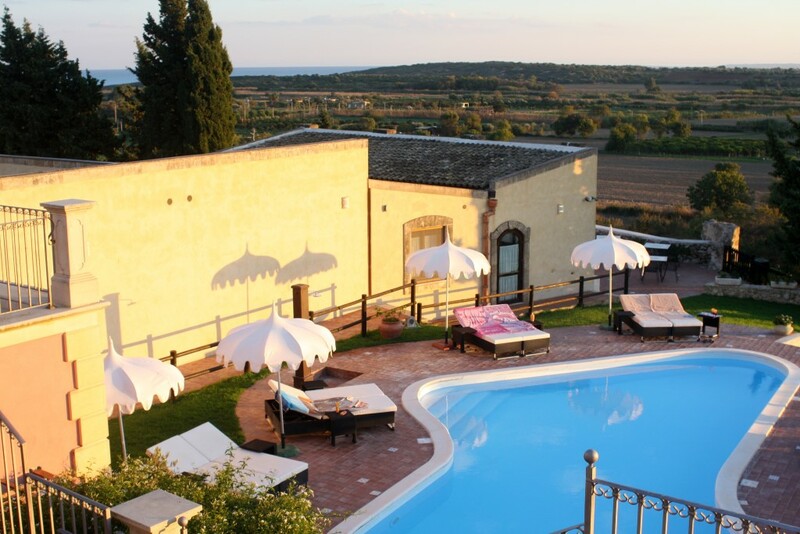 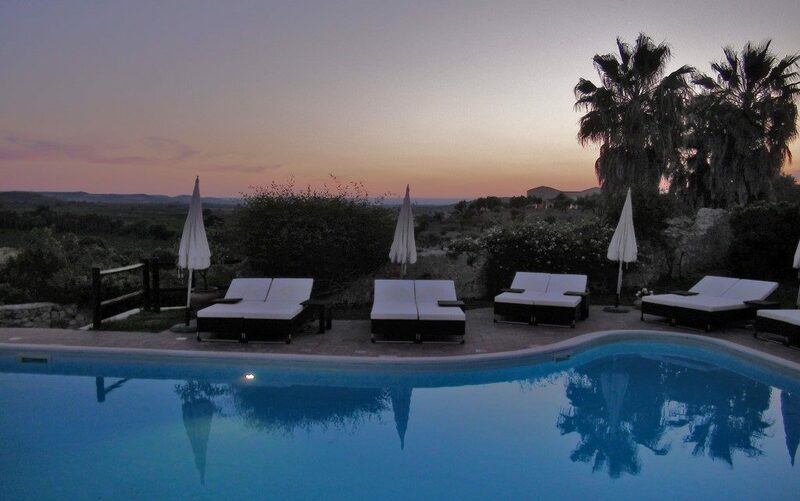 An intimate and charming swimming pool with an amazing view of the Vendicari Nature Reserve invites you to swim and relax in the silence of the Sicilian countryside. 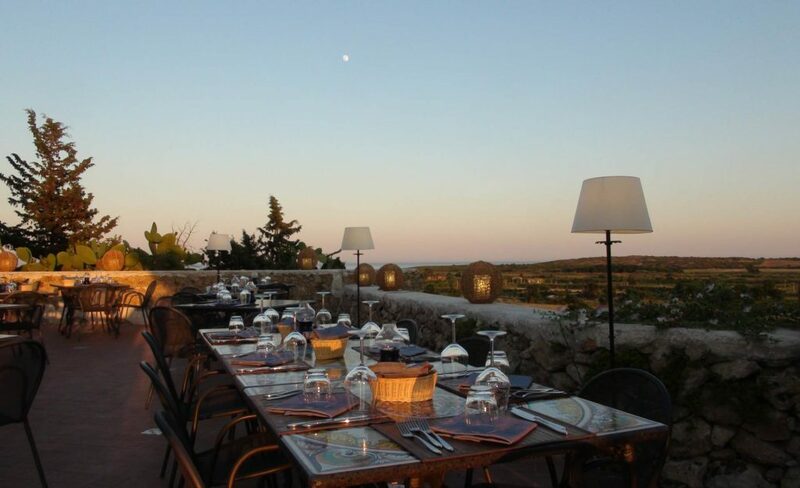 At night, the soft light of the sunset makes suffused plays of light under a beautiful starred sky that smells of Mediterraneo. 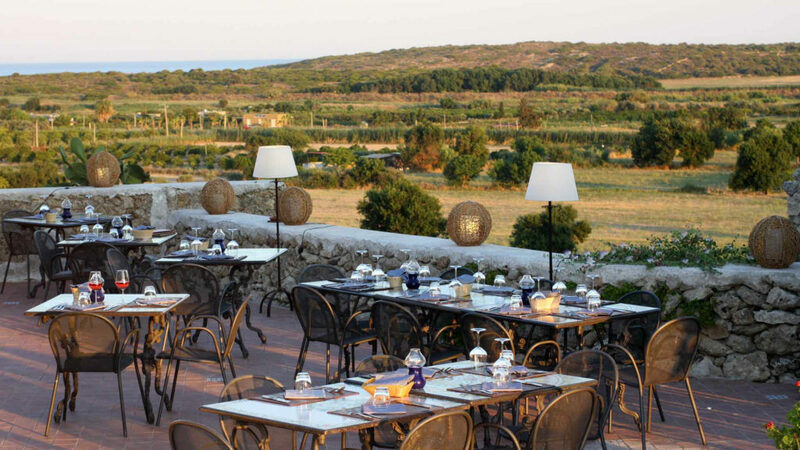 With a view of Vendicari, the Restaurant Le Muse offers recipes of the Sicilian tradition, in some cases reworked by our chefs. 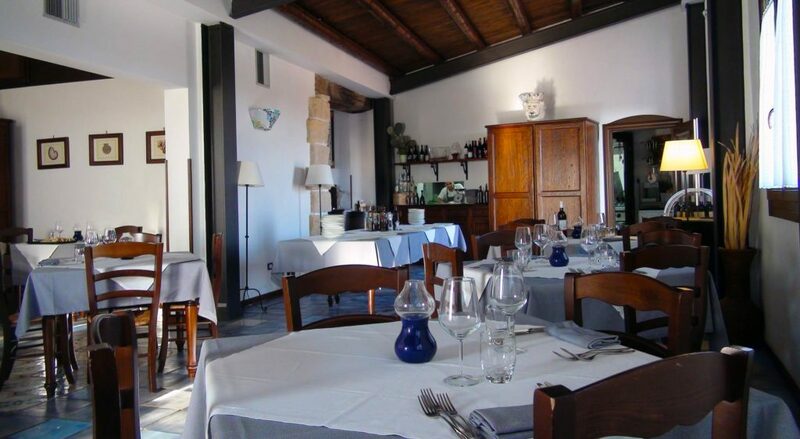 The restaurant has two intimate dining rooms. 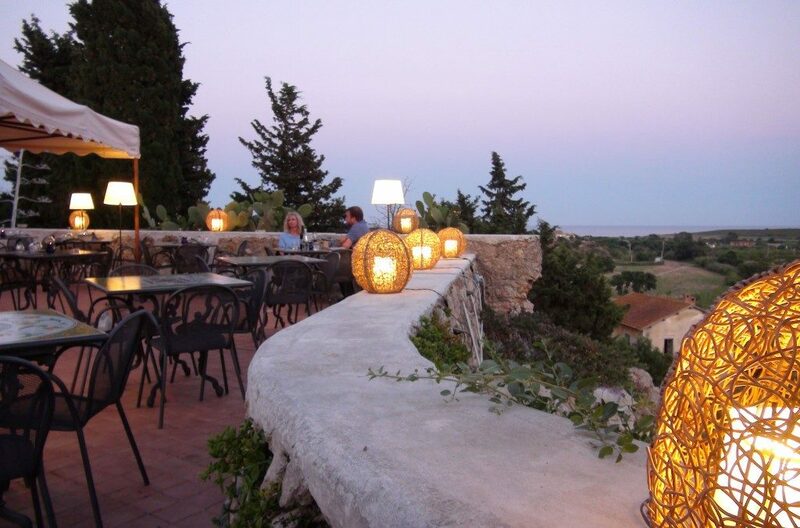 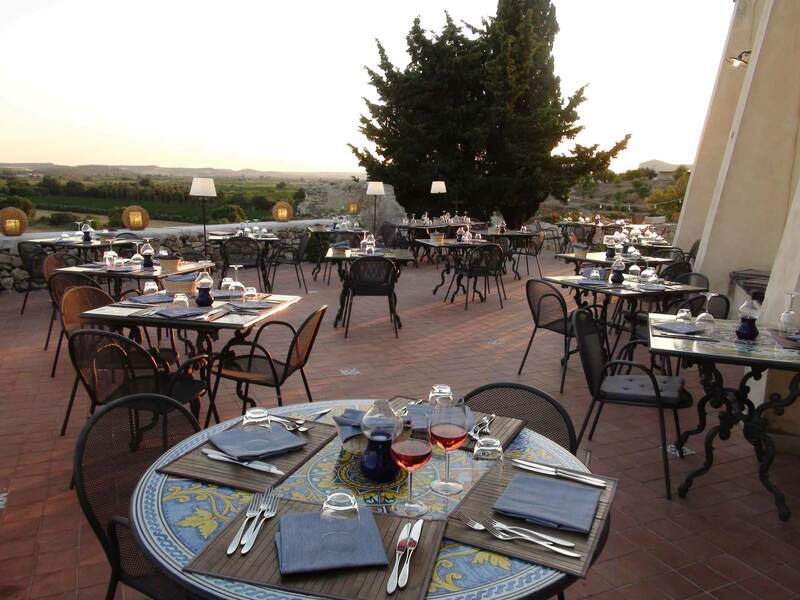 In summer, open-air dining takes place on a wonderful terrace with Caltagirone terracotta tables and panoramic view. 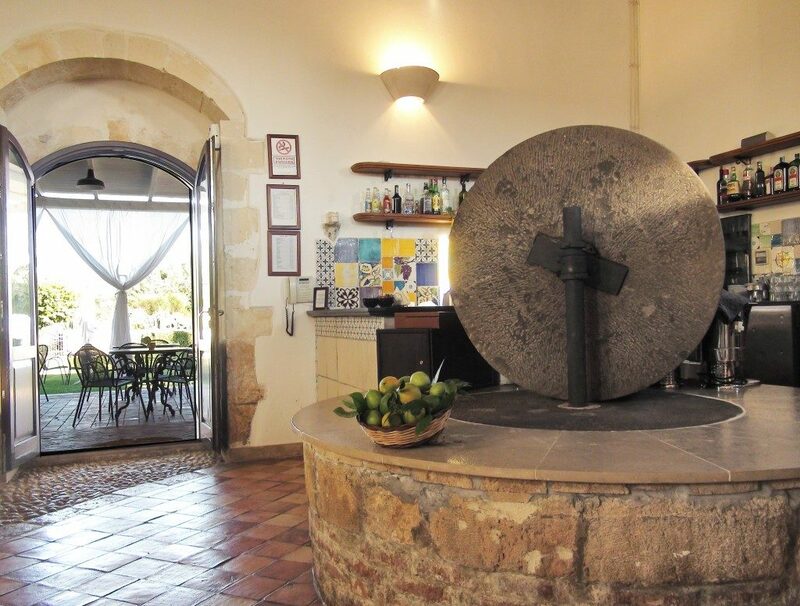 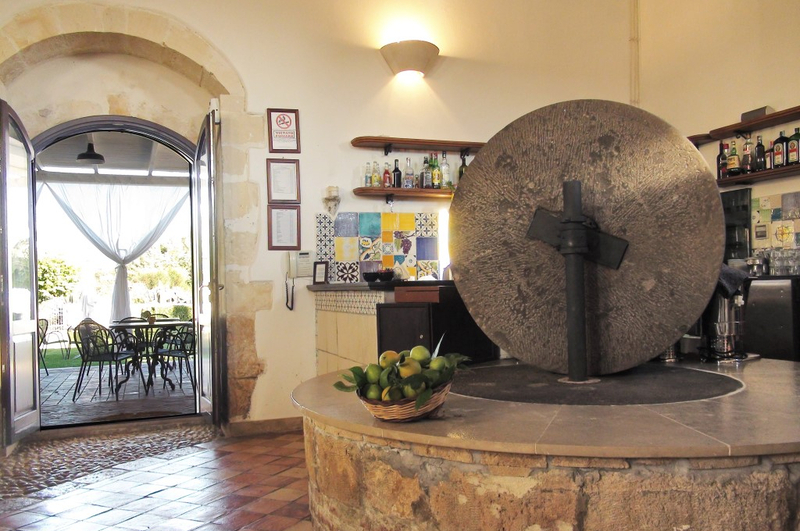 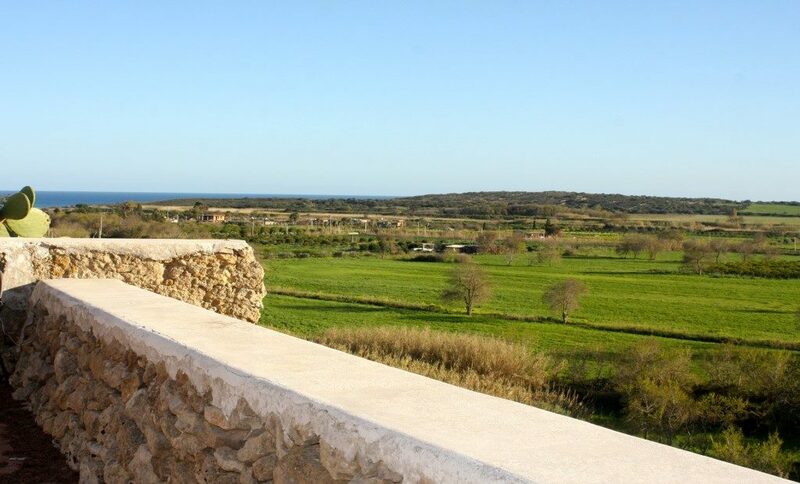 An old yet carefully renovated mill from 1887, once used for pressing olives and grapes, is now the café with a view of the Vendicari Reserve. 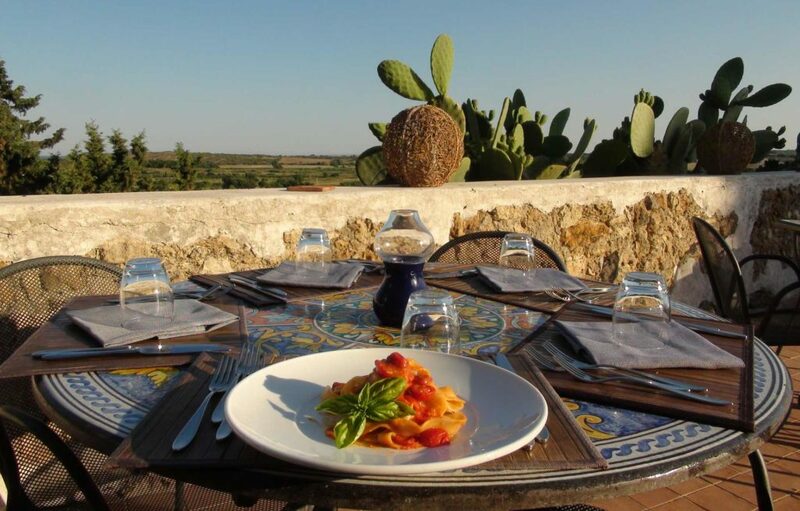 Breakfast is served here on beautiful Caltagirone terracotta tables. 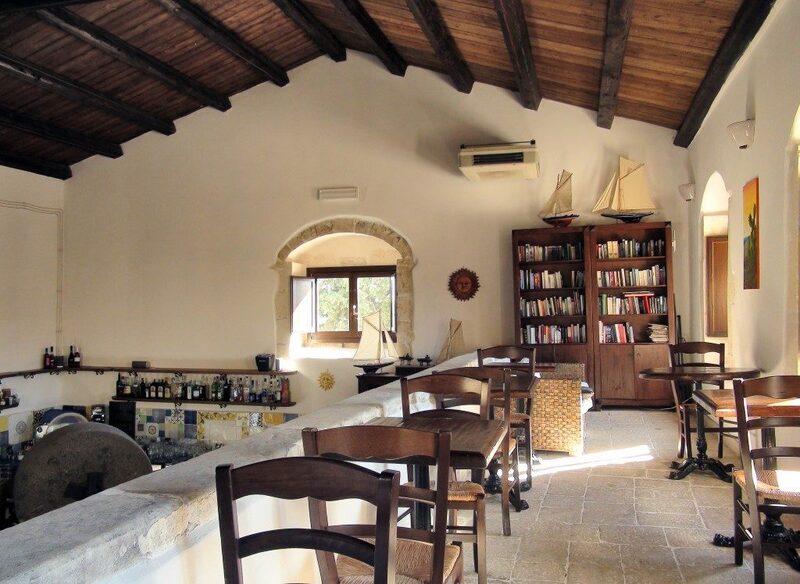 Inside, a mezzanine hosts a library with sofa, a cozy spot perfect for reading a book or browsing through a magazine. 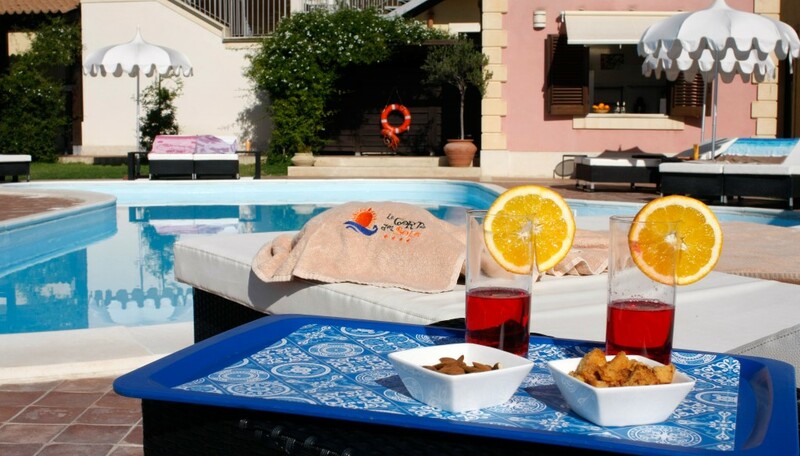 By the swimming pool, a café serves light lunches made of cold dishes, tasty salads, fresh fruits, sandwiches and snacks, a perfect way of eating without leaving the pool. 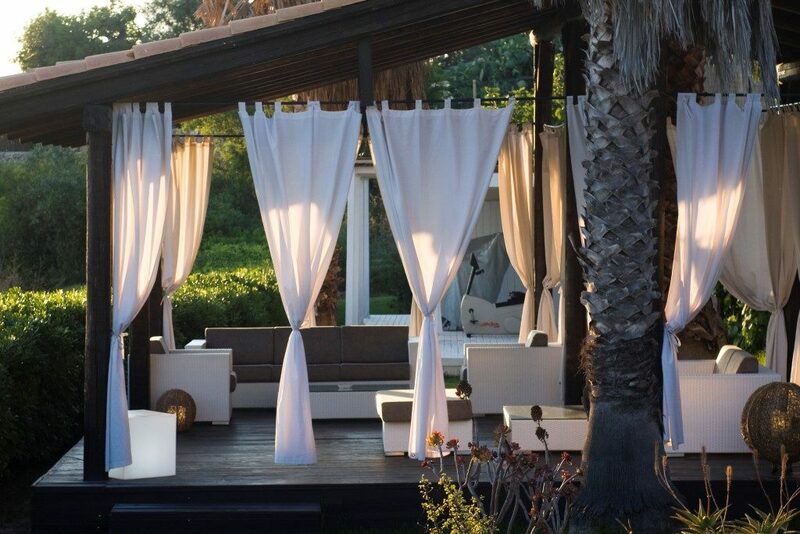 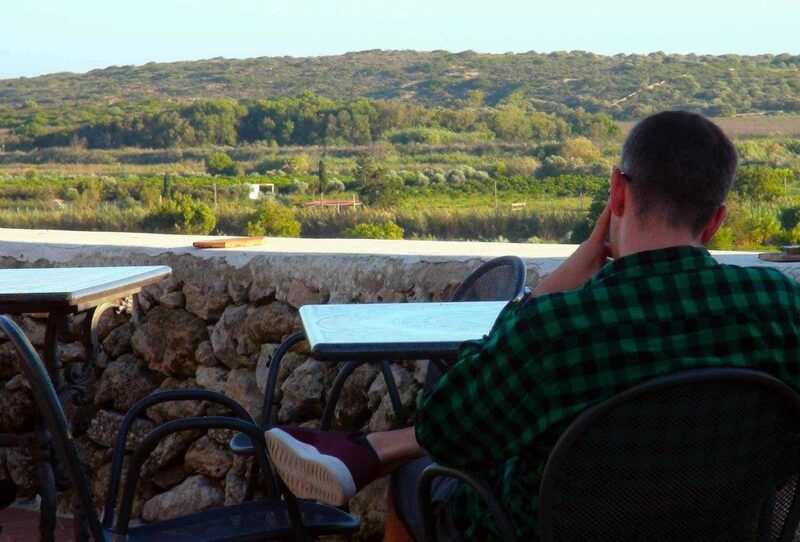 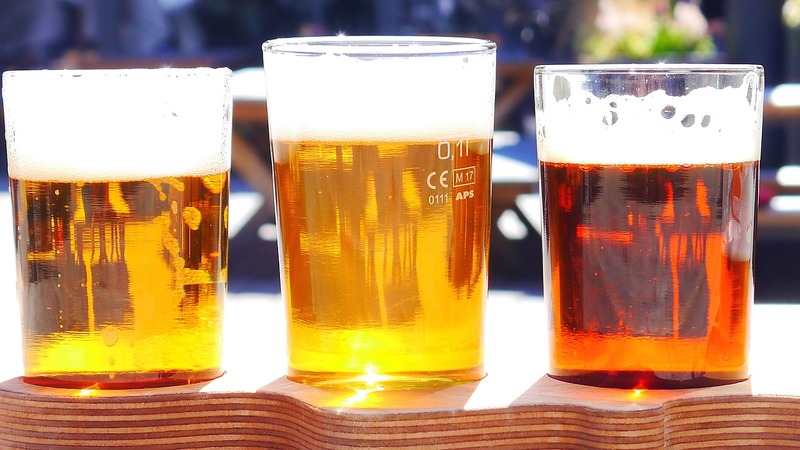 During the hot summer days, our staff will serve you soft drinks and cocktails, cool wines and craft beers in front of the amazing view of the Vendicari Nature Reserve. 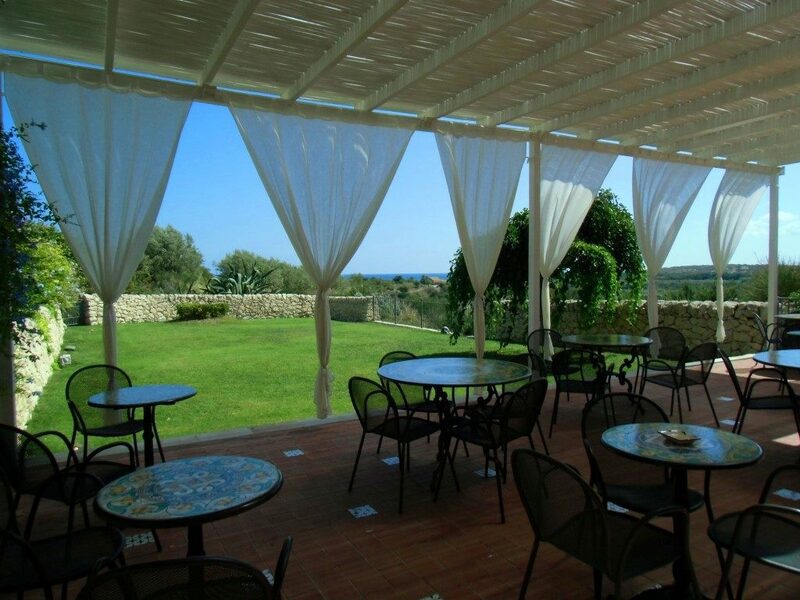 A little secluded from the pool and the café, overlooking the panoramic view of the sea, a gazebo with comfy sofas is perfect for those guests looking for peace and silence, for a place to read or relax. 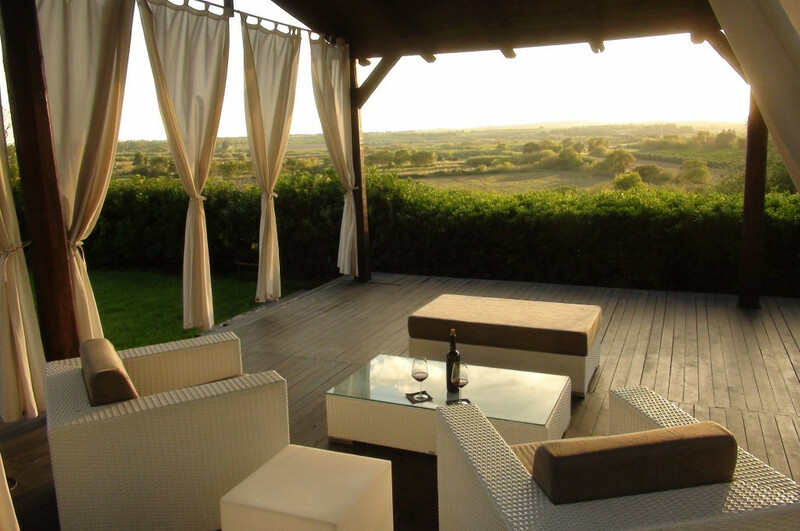 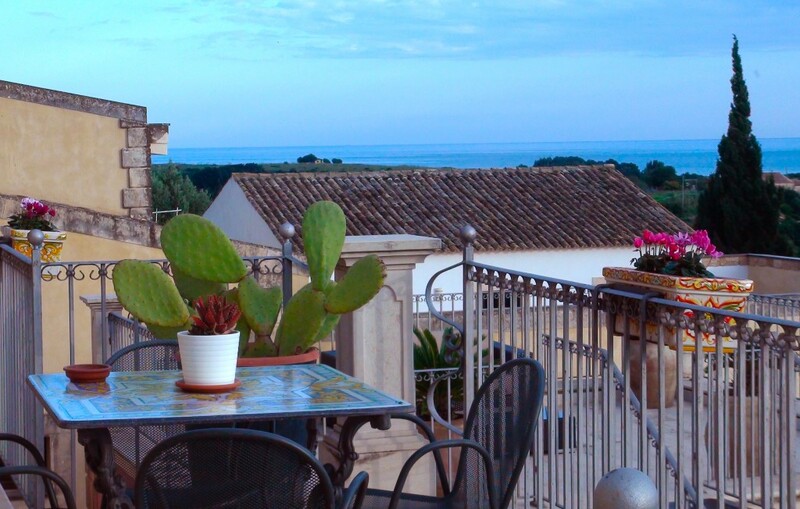 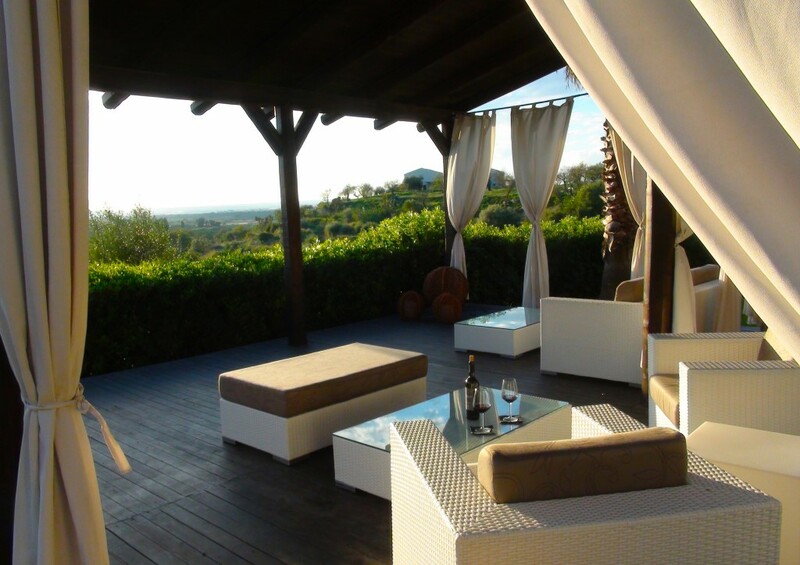 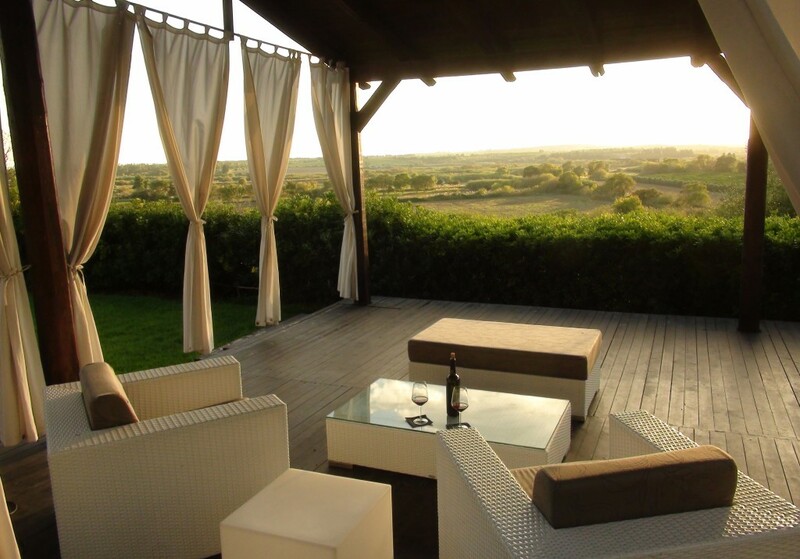 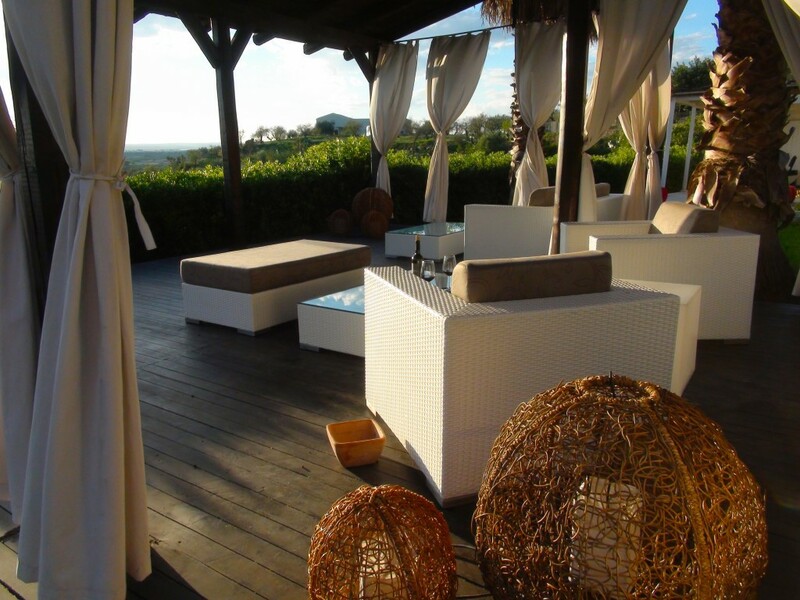 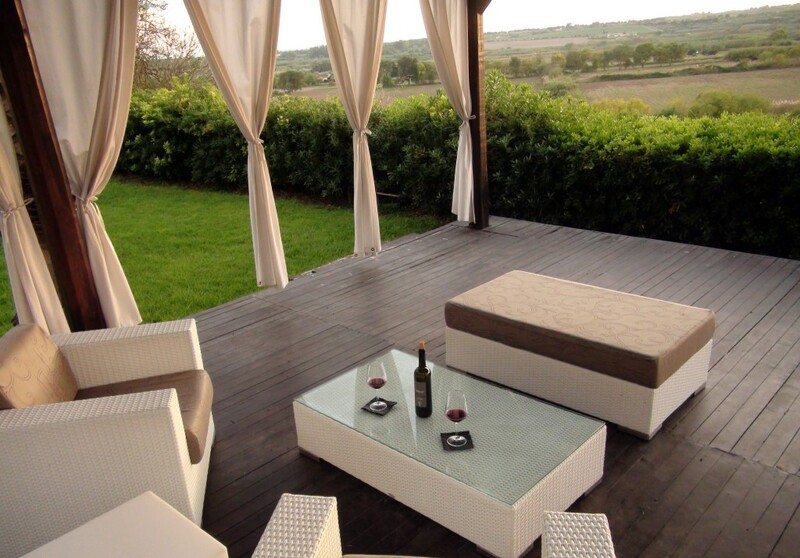 Comfy sofas and beautiful Sicilian terracotta tables furnish the many terraces of La Corte del Sole, offering relaxing and silent corners where sip some wine or enjoy the view of the sunset on the countryside of Noto. 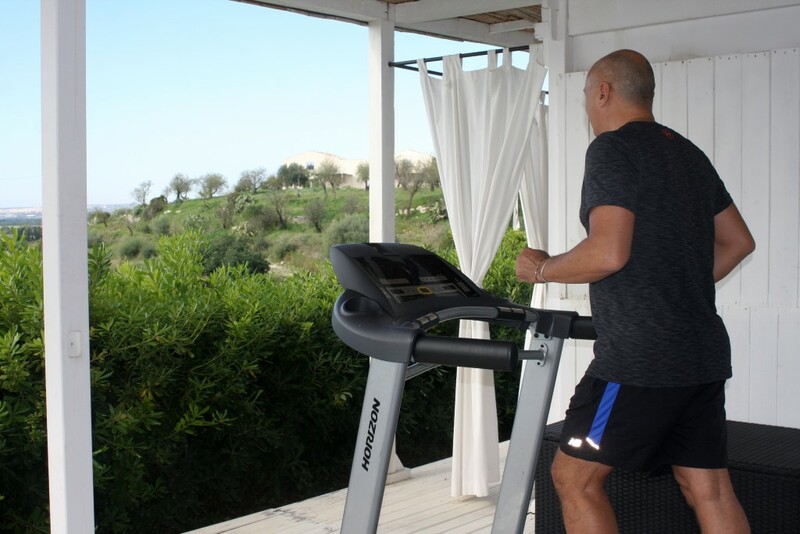 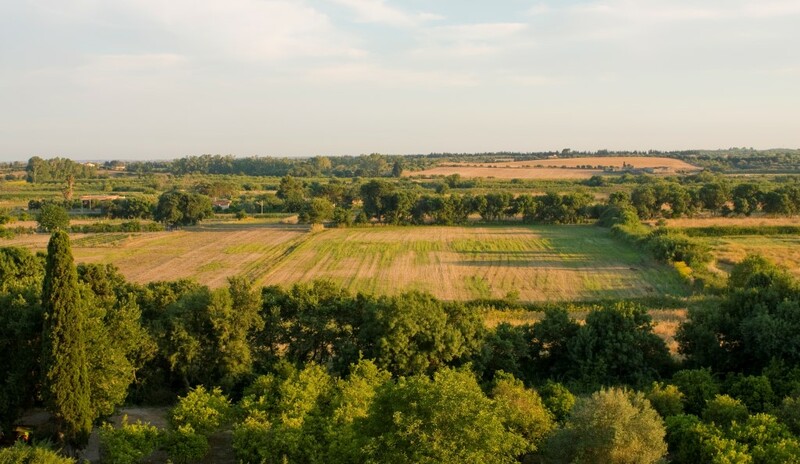 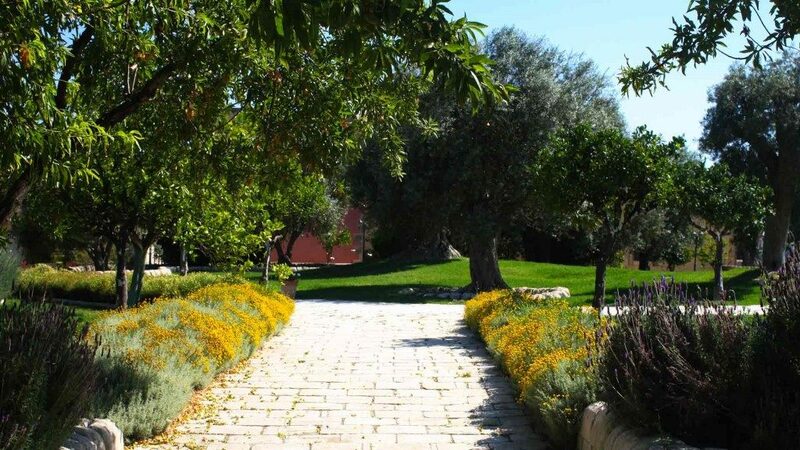 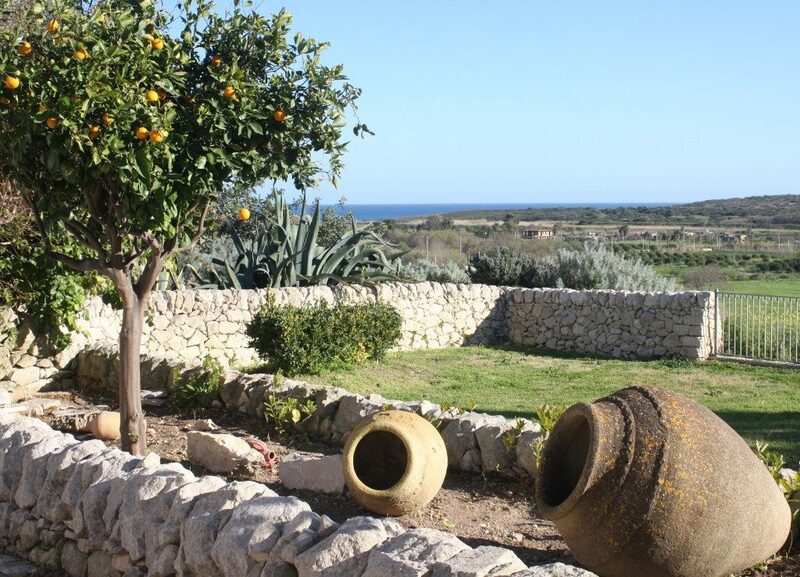 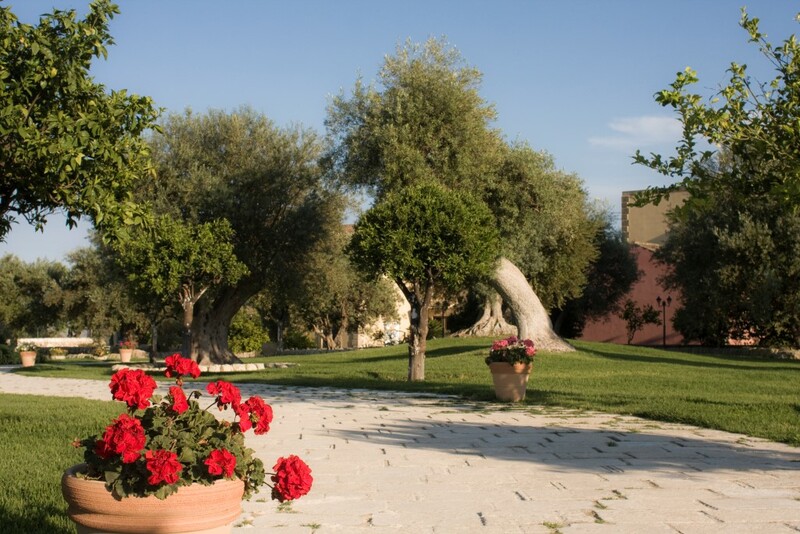 The masseria is enclosed by different gardens where nature welcomes our visitors with the intense scents and colours of the Mediterranean nature. 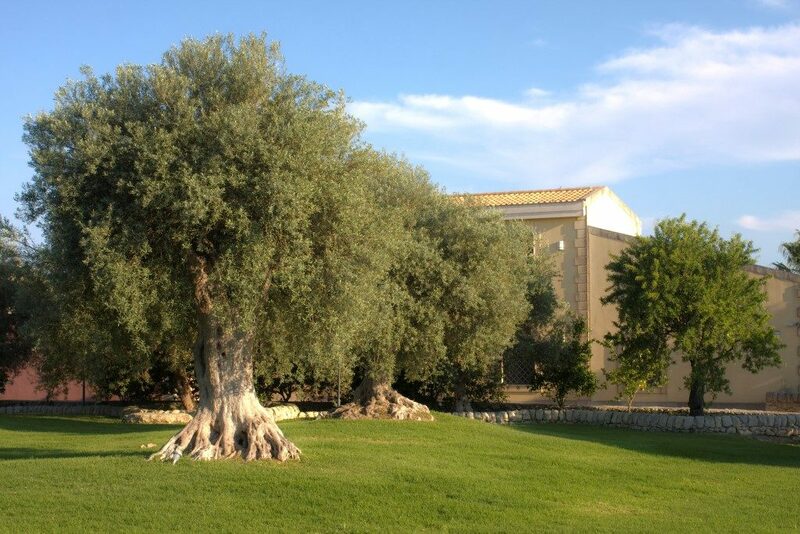 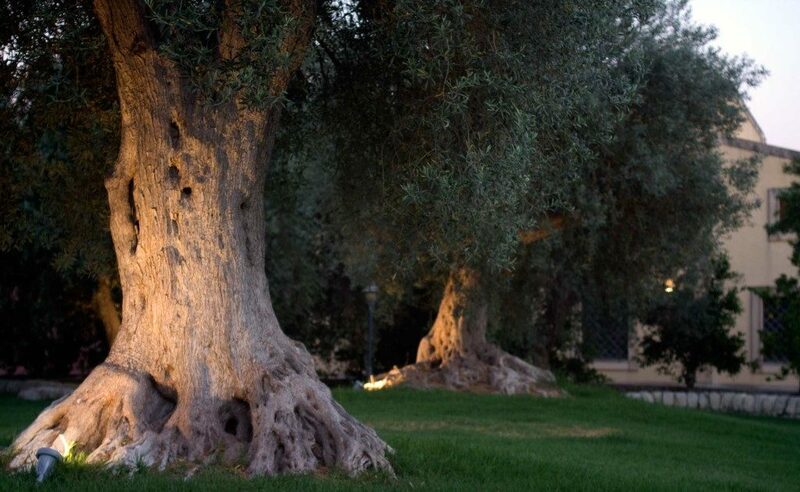 A big lawn spotted of century old olive trees, the symbol of this land, is set at the entrance of the hotel. 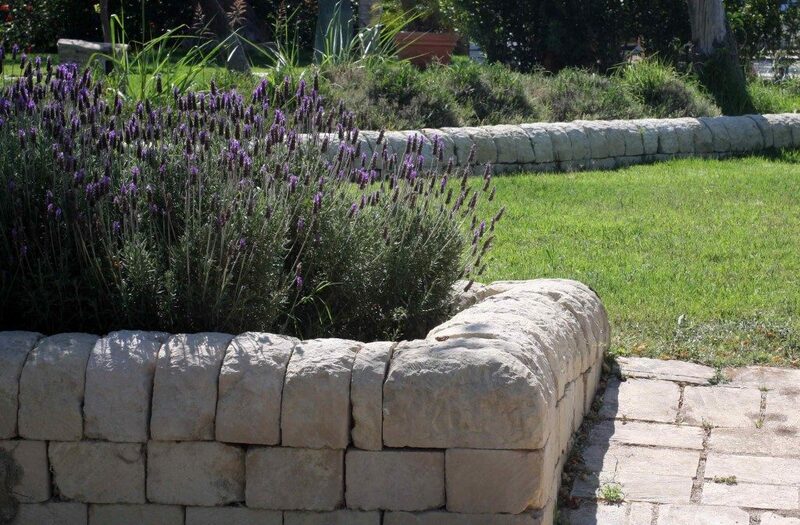 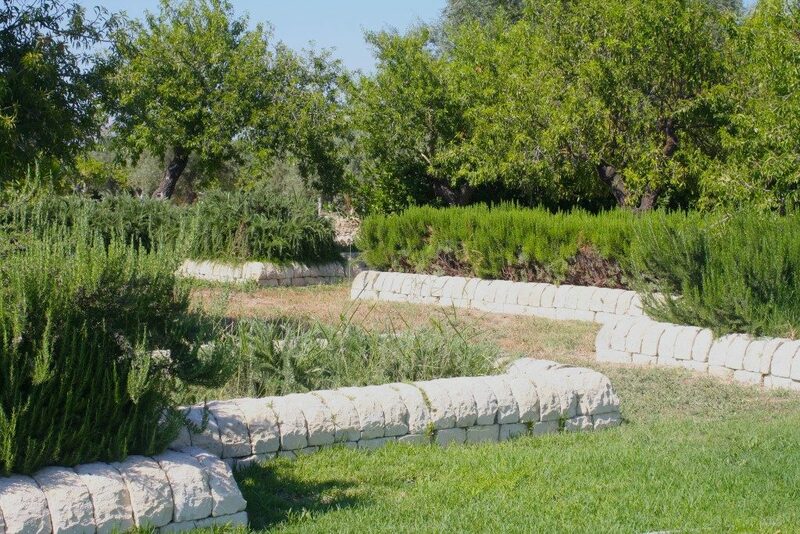 The aromatic garden, with different species of wild herbs, invites you to take a walk through the scents of the island. 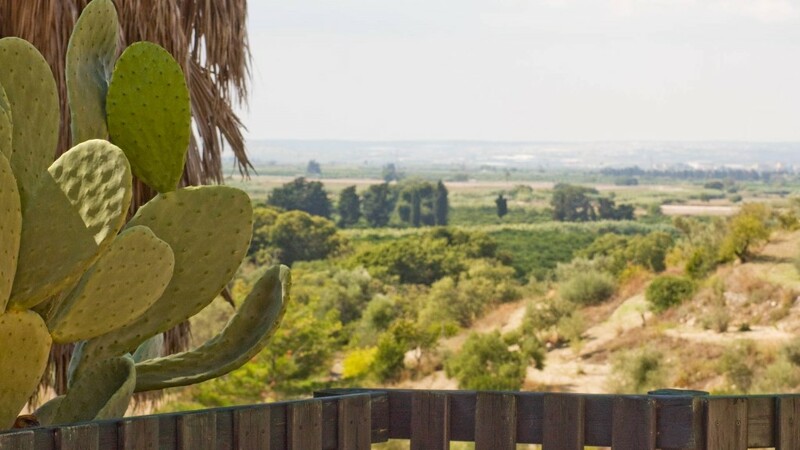 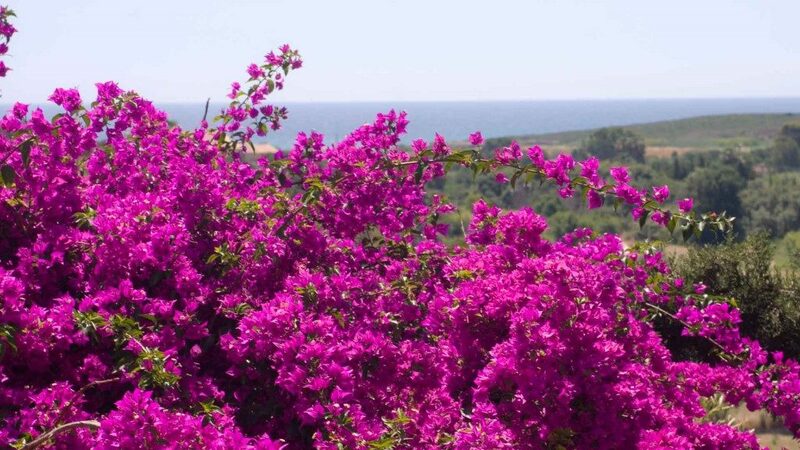 Other green areas are on the South side of the hotel, overlooking the sea and the Vendicari Reserve.